Natural gas from the offshore Tamar field reached Ashdod on Sunday night after it was pumped to Israeli shores for the first time Saturday, four years after its discovery. The Tamar deposit, discovered in 2009 some 90 kilometers west of Haifa, holds an estimated 8.5 trillion cubic feet of natural gas. On Saturday, hailed an “important day for the Israeli economy” by Prime Minister Benjamin Netanyahu, natural gas from the field was pumped to a newly erected facility on the coast of Ashdod, connected to the gas field via pipelines laid out on the ocean floor, 150 kilometers long and 16 inches wide. On Sunday, the gas finally reached the Ashdod processing plant from which it will start to flow into the Israeli market. This newly harnessed resource promises to be a major boon to both the country’s public and private energy needs. The gas from Tamar is expected to help meet Israel’s energy needs for the next 20 years, Channel 2 said, and will save the economy some NIS 13 billion (some $3.5 billion) per year. Its ahead-of-schedule use will also save Israeli citizens some cash — lowering a planned rise in electricity costs to 6 percent, less than originally planned. The Tamar deposit, and especially the heftier Leviathan, which was discovered in 2010, are expected to provide Israel with enough natural gas for decades and transform the country, famously empty of natural resources, into an energy exporter. Leviathan, which boasts an estimated 16 to 18 trillion cubic feet of gas, is expected to go online in 2016, the approximate time when exports are expected to begin. The discoveries are just a portion of the huge reserves in the Levant Basin, which the United States Geological Survey estimated in 2010 holds some 122 trillion cubic feet of recoverable natural gas. For 62 years we have made the desert bloom, innovating water & drip irrigation technologies which have literally changed agriculture and the planet itself. Sadly, our quest for the desert’s more famous yield – Oil has been less than fulfilling. Surrounded by the world’s largest energy exporters Israel until now has been no pun intended, dry. The planet is addicted to oil, nearly everything today is seemingly petroleum based. But the age of big oil is slowly coming to an end. Oil is dirty as evidenced by the tragic disaster off the US Gulf Coast. Developed economies are scrambling to move and develop cleaner burning technologies to both supply our fuel, as well as skyrocketing global energy needs. Coal & Oil aren’t going anywhere just yet, but the next century may belong to Natural Gas as the new big boy of global energy. The last 2 years have seen blessings bestowed on the State of Israel with the discovery of massive natural gas fields in the Eastern Mediterranean by Texas based Noble Energy & Israeli consortiums. Discoveries within arms reach of the Israeli coast and within our territorial waters. In 2009 the Tamar Israel discovery rippled across energy markets, Tamar discoveries can power 50% of Israel’s energy needs for the next 4 decades. Now in 2010 a new unbelievably larger reserve named Leviathan may yield massive amounts of natural gas, estimated at possibly twice the size of Tamar! If Leviathan yields, it can transform Israel into a global energy exporter. The Leviathan natural-gas site off the Haifa shore could be twice the size of the Tamar prospect, the largest gas discovery globally in 2009, and position Israel as a gas exporter in coming years, US oil operator Noble Energy Inc. said Thursday. “In March, when I was last in Israel, I said that Noble Energy planned to be here for decades to come,” Noble Energy chairman and CEO Charles Davidson said Thursday. “I am thrilled that today’s announcement substantiates the potential of a new and significant energy basin in the eastern Mediterranean, which, if successful, could position Israel as a potential energy exporter in future years. Noble has to date been a gracious partner, aware of the delicate needs in Israel to both drive profit and secure the State energy wise. By the same token, Noble and its consortium of Israeli partners will require the State of Israel to tap these reserves. Apart from licenses, there are unique security needs, as well as substantial infrastructure investments needed which will largely fall on Israel to supply. Of course, If Israel has it, you can rest assured Hezbollah wants to lay its greedy little Islamofacist hands on it. The exploratory permits licensed to Noble and its partners where these discoveries are being made are clearly off Israeli waters. The Lebanese know that the messy little country they have thanks to their pals like Syria & Hezbollah will not draw the billions in foreign exploratory & drilling investment needed to tap whatever reserves may be off their own coast. That has not stopped Lebanon jealously eyeing Israel’s new reserves, or Hezbollah from issuing threats. After all, Israel belongs to them as per Hezbollah ‘logic’ – Muslim lands occupied by Zionist invaders! Hizbullah claims that that the natural gas fields recently discovered in the Mediterranean, belong to Lebanon and warned Israel against extracting gas from them. Iranian English language paper “Tehran Times” quotes Hezbollah’s executive council chief Hashem Safieddine as saying that it would not allow Israel to loot Lebanese gas resources. 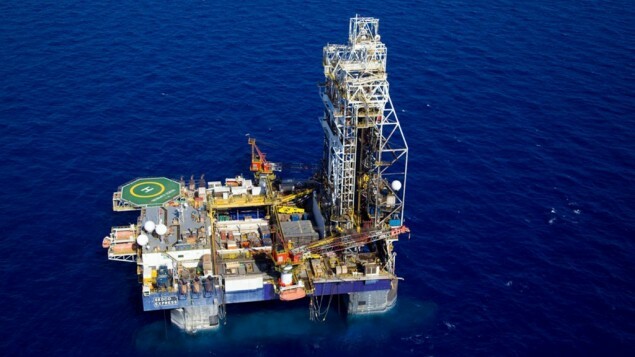 Marine law expert Amir Cohen-Dor of the S. Friedman & Co. told “Globes” that the Dalit and Tamar gas fields are within Israel’s contiguous economic zone, and that under the 1982 UN Law of the Sea Convention, Israel can exploit resources in its economic zone. Both Hezbollah & the Lebanese Parliament which are today one & the same are getting in on the threats. Make no mistake, this is a threat against infrastructure, pipelines, rigs, shipping and investment needed to tap the reserves that will all be required in the future. The Lebanese have gone so far as to issue veiled war threats..
Lebanese daily “As-Safir” today accused Israel of stealing Lebanon’s natural gas. Lebanese parliamentarians made similar accusations following the discovery of the Tamar and Dalit gas reserves in 2009. “As-Safir” correspondent Halami Mussa wrote, “Israel plans to steal natural gas from the territorial waters of Lebanon.” He claims that “the reserves are located outside the territorial waters of Israel and are in Lebanese territory.” […] “a serious political and economic issue”, which could be cause for a diplomatic dispute between Israel and Lebanon. With Israeli sovereignty being questioned as usual by Islamists & terrorists, and Lebanon laying absurd claim to Israeli natural gas discoveries the potential for conflict is real. Israeli withdrawals from Lebanon have been certified by the UN, yet that did not stop Hezbollah from launching a war in 2006. The Israeli coastal demarcations are also clear, there is little reason to believe that will stop Hezbollah or its patrons from trying to initiate conflict, terrorism & violence either. This is part and parcel of the Noble partnership with Israel. Infrastructure – both sea based and land based to process the LNG will need to be patrolled, secured. The State may even be forced into war to secure safe resource extraction. The notion of Israel becoming an energy player will drive the Iranians and their lapdogs mad, that is to say on top of their already certifiable Islamist state of psychoness. Further, Turkish relations with Israel have been spiralling and it has less to do with Gaza aid flotillas, more to do with large economic interests such as these Gas discoveries. Peace and even clean burning energy in the Middle East does not come cheap.